Today Native Instruments unveiled a new version of Traktor DJ, named Traktor DJ 2. The new version is quite different from the original version that only worked on IOS devices since it can work on both Windows and Mac as well. At least for now, Traktor DJ 2 will only work with the Traktor Kontrol S2 MK3 and IOS devices. Will TRAKTOR DJ 2 replace TRAKTOR PRO 3? TRAKTOR DJ 2 is based on an entirely new codebase that will set TRAKTOR up for the future. TRAKTOR PRO 3 remains the most advanced incarnation of TRAKTOR. It’s used by professionals worldwide on a daily basis and will continue to be our flagship DJ software for years to come. TRAKTOR DJ 2 and TRAKTOR PRO 3 will therefore be developed and updated in tandem in the coming years, until we and our professional users consider the new platform to be mature enough to make the switch. Traktor DJ 2 also integrates with SoundCloud GO, which gives you access to the entire SoundCloud library of sounds and tracks. 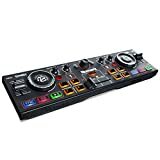 There is no word about compatibility with other DJ controllers besides the Traktor Kontrol Z1 and the Traktor Kontrol S2 MK3, but it’s reasonable to expect that it will work with other controllers as well, especially as its feature set is expanded. Native Instruments Releases Traktor Pro 3.1! Black Friday DJ Gear And DJ Software Deals!